Sell anything from your WordPress website easily. The WordPress Simple PayPal Shopping Cart is a very easy to use and lightweight WordPress plugin that allows you to sell products or services online in one click from your WordPress blog. 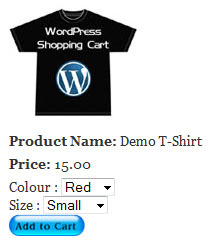 WordPress Simple PayPal Shopping Cart lets you add an ‘Add to Cart’ button anywhere on your blog. This plugin also allows you to add the shopping cart anywhere in a post or page or sidebar easily. The shopping cart shows the user what they currently have in the cart and allows them to add or remove items. The payment is processed by PayPal. 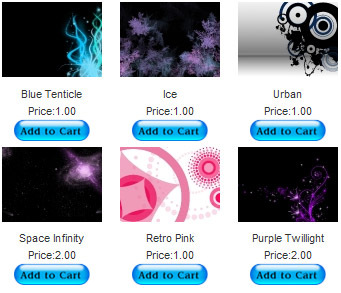 Below is a screenshot of how the shopping cart looks when customers add products to the cart. I am using the WordPress eStore (plugin to sell digital products securely) which is a premium version of the WordPress PayPal Shopping Cart plugin. So I had to disable this simple shopping cart on this blog as I didn’t want to run two WordPress shopping cart plugins on the same site but you can visit the WordPress eStore plugin page and play with the add to cart buttons to see how this plugin works (It will give you a good idea as the “add to cart” feature of both these plugins are similar). You can sell digital media files with this plugin. Check the usage documentation to learn more. NextGEN Gallery (developed by Alex Rabe) is a fully integrated Image Gallery plugin for WordPress with a Flash slideshow option. Instructions on how to do it can be found on the sell photos from WordPress tutorial. 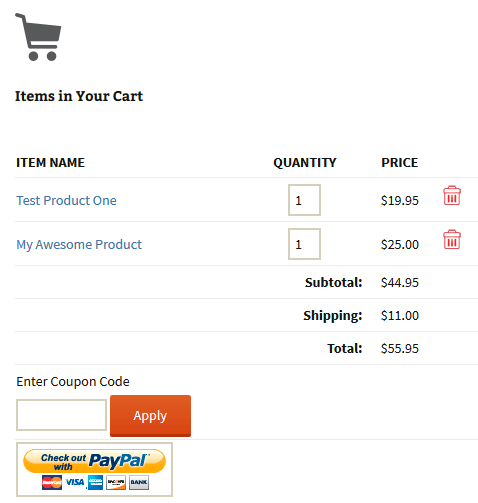 Download the WordPress PayPal Shopping Cart Plugin. View the change log here. You can also try the WordPress Easy PayPal Payment or Donation Accept Plugin that can be used to Accept PayPal payment for a service or a product or Donation. 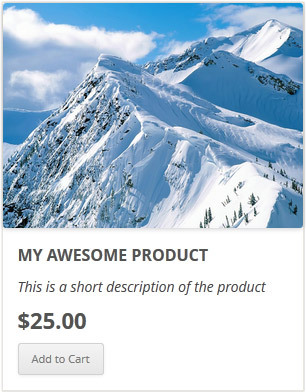 If you are looking for a professionally supported, feature rich and robust way to sell products or services then checkout our WP eStore plugin. @Kim, The plugin only sends notification after a PayPal transaction. If a transaction is not complete, no email is sent. Is there a way to NOT send the notification email if the Paypal transaction is not completed? 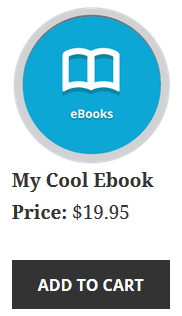 Is there any way to display a shopping cart icon in the Primary Menu Bar (along with a summary of added items/price) with this plugin ? When cart is empty, there is no message stating Cart is Empty. Have I missed checking something? @Joel, Yes all of our plugins have been updated according to the new PayPal guidelines. Has this plugin been updated to meet PayPal’s new guidelines in regards to “IPN Verification Postback to HTTPS”? I know these guidelines aren’t essential yet according to PayPal. @Lallah, Yes you can simultaneously use all those plugins on your site. I think this free plugin will do the job for you. I am creating a store for a non-profit. We have physical items to sell and also accept general donations and donations for specific projects. Is there a way to easily integrate a donate button with this plugin? Can I run WP Simple PayPal Shopping Cart simultaneously with WordPress Easy Paypal Payment or Donation Accept Plugin? Can this be done with free plugins? What is the best way to do this? @Hagus, Upgrade your PayPal account to a premier or a business account (its free) and then that option will be there. PayPal doesn’t offer the credit card checkout option for merchants using personal PayPal accounts. @Tom, yes you can enable the sandbox testing option in the plugin then use your sandbox account seller address in the PayPal email address field. Then do a sandbox test transaction. Can our Sandbox Paypal accounts (buyer and seller) be used to test checkout button created by this plugin? Just want to THANK YOU for this great plugin! I’m not really well-versed with WordPress especially HTML side but with your plugin, it made my life easier. Thank you! Is there any way to add a Shopping Cart Icon in the header of the page? Just one which shows what the visitor has in their shopping cart regardless of the page their on? @Alex, What do you mean by the product checkout UI? @Debbie, The eStore has a sold out option. You can enter in the amount of tickets you have for an event (example 100). Once the 100 tickets have been sold the buy button will become a sold out image. I just fount your eSTORE plugin – does it have the capability to limit the amount of sales? It looks like it does but I just want to be sure. Thanks! After trying way too many event registration plugins, I found your plugin and decided it was the better way to go for my business. As a designer and not a programmer, I love the ease of configuration and the control I have over how my pages look. My only request is that there be some way to keep track of sales, so that if an event fills up, people won’t be able to pay for spots that aren’t available. Thank you! Thanks for this great plugin,works really well,Thank-you. I am having troubles using Canadian currency with this plugin, what abbreviation do you use to specify Canadian Dollars? @Sonny, Click on the shopping cart installation and usage documentation link in the page above. Then search for the word “variation” and you will find the section that has shortcode examples. Can you tell me where I can find the variations “copy paste” short codes for the different products? Cant seem to find them or figure out how to do that? Trying to create a nice product box with three different options each for several different products. @Sal, you shouldn’t have any issue with upgrading. I want to update to the latest wordpress and the newer version of your plugin. do you think i will have a problems upgrading from v3.2.3 and WP v3.1.2? How do I add a space please? @Steve, What do you mean by multi-buy discount option? How can I get an empty cart to display on the items page? That area of the page is empty until something is added to the cart. I have the text “your cart is empty” in the empty cart field on the setup page. This plugin is great, I’ve used it for a couple of client sites who wanted a simple solution that worked, and this ticks all the boxes. Almost. Is it possible to set up a multibuy discount option or do I need the pro version for that? @Narcs, You can update the language file of the plugin and send it to us. That way we will be able to include the updated language file in the next version. How can I settle and fix the spanish language in order to keep it when updating? @Michel, I believe the following is what you are looking for. Hi! can i add a international shipping? @Pierangelo, You have a bit of issue with HTTP POST on your site. Maybe your theme is messing something up. Do what is explained in the video labelled “Create a Specific Checkout Page” and you should have a workaround. First of alla Great Plugin! I’m using it with a one page site template and I’ve got some problems with the specific checkout page. I’ve followed exactly your tutorial but when I click on the “add to cart” it result as an error “OOPS! THAT PAGE CAN’T BE FOUND.” But the section page is created and everything else is ok. Do you think could be because is a page section and not a page? Any ideas why this stopped working and how to fix it? @Melissa, You can customize the add to cart button text or use a custom image by configuring it in the settings menu of this cart plugin. Go to the settings and look for a field called “Add to Cart button text or Image”. When you have a Spanish version of WordPress installed or configured, it will detect it and use the Spanish language. How can I add my own add to cart button instead of the default one? The add to cart button in my blog is a plain gray button. I would like to add my own add to cart button. Can someone tell me if this is possible and how to do it? What’s the process of changing the language of the shopping cart? So that clients see the cart in spanish and not in english? I know that spanish language is inside the language folder, but I don’t know how to select that or configure it. Can someone help me? I have two products I’d like to sell, a print book and an ebook. The print book works fine; when I add the ebook, it keeps repeating the information about the print book.